Vincent with his catch of the day! One for the lady fishers! 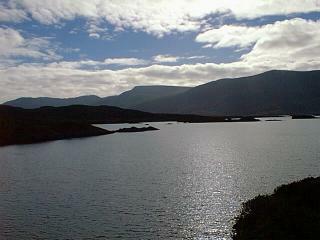 Interested in catching some Salmon or Trout here in Waterville, Co Kerry? Bringing the whole family to Kerry for a holiday? Looking for some activities to do...not just fishing!? 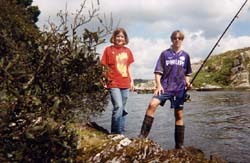 We organise excellent fishing holidays for you and all the family. Your ghillie & guide Vincent Appleby will take you around the surrounding area of Waterville where salmon & sea trout are plentiful! 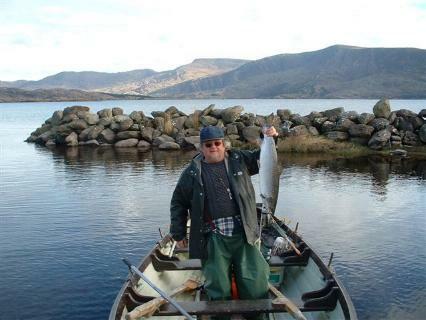 Lough Currane nearby is an excellent spot for Salmon fishing in March and April. 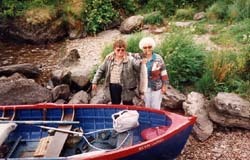 From June we have the finest sea trout fishing in Ireland. So what are our methods for catching the most salmon? The boat is held by the boatman on the oars so the boat is not permitted to drift across the holding areas, where large numbers of salmon shoal up and congregate. This provides a floating platform, and with the wind behind the fly-fisher, this gives the angler maximum assistance in casting the fly. Large numbers of salmon are caught each season by trolling baits and lures behind the boat in all areas of the lake. We provide all fishing facilities i.e., rods, boats with engines. Salmon flies 4-8 are advised to be fished on a floating line and account for many fish throughout the year. Sea Trout run from March onwards but large numbers are caught from May onwards and are widely distributed over the whole lake and caught during the day. Wet flies on sunken or floating lines are recommended and the best flies are mallard & claret, raymonde, black pennell, watsons fancy, bibio, bog fly, straw grouse, golden olive, peter ross, conermara black, butcher, Alexandra, invicta, Waterville blue. Boatmen can be hired by the day or week and are all experienced, in addition to being able to introduce anglers to the best lies, they all help create an interesting day’s fishing! This includes boat hire, ghillie and fishing tackle. For further information please do not hesitate to contact Vincent and he will be more than happy to help.